Are you a fan of the hit show Supernatural? 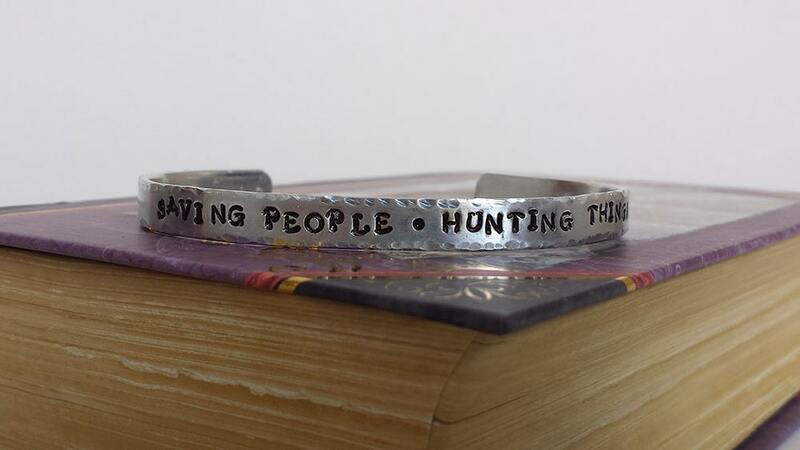 Show off your geeky side with this hand stamped aluminum bracelet displaying the quote "saving people - hunting things," the family business! The cuff bracelet is 1/4" wide, 14 gauge (~1/16" thick) aluminum. The stamped impressions have been darkened for contrast. To be added to cart with ordered items. You may fully customize this cuff to suit your own style. Please read through these options carefully and indicate your choices in the "note to seller" upon checkout or, in some cases, in the dropdowns to the right. If you do not indicate a choice for an option, we will use the default settings as pictured in the finished product above. Bracelet cuffs should be around 1" to 1 1/2" smaller than your wrist. You should be able to slip the cuff over the side of your wrist and turn it into place. If the cuff is too small, you will need to open and close it constantly, and it will eventually break from the strain. You can easily measure your wrist with fabric measuring tape OR measure a string or strip of paper after you have wrapped it around your wrist. Contact us if you have any questions about sizing. 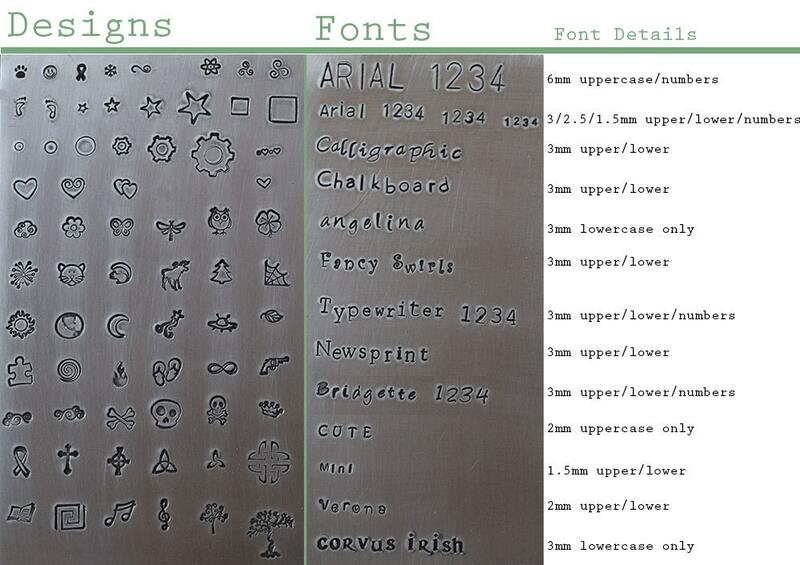 Choose a font from options in the Designs and Fonts photo above. Depending upon the font, you can choose all uppercase, all lowercase, or normal (first letter capitalized).Please indicate your choice in the "note to seller" upon checkout, if different from the product photo. We have a variety of design stamps available. Please see the Design and Fonts photo for our current selection. Some of the designs might be too large for this item. Please contact us if you have any questions about what designs will work. This item does not come with a default design stamp. If you see one that you would like to have either surrounding the text or at the ends of the cuff (a very popular option! ), please indicate your preference in the "note to seller" upon checkout. For multicolored, let us know in the "note to seller" if you would like a rainbow effect or if you prefer specific parts of the impressions to be specific colors. 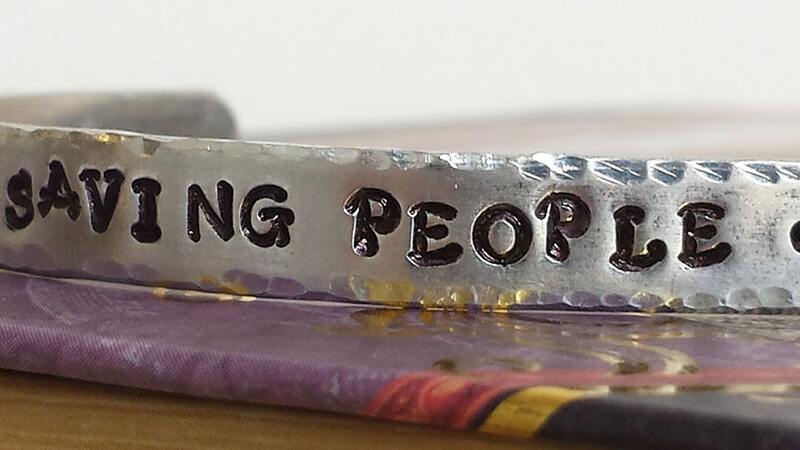 All of our stamped items are handmade and made to order, so each piece will be unique. While we do our best to match the product picture, your item will have small variations that give it a life of it's own. Great cuff, wonderful communication from seller. Highly recommended! Love!!! Perfect gift for my best friend! !